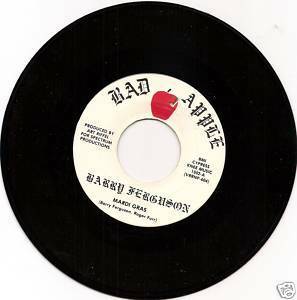 Bad Apple 1502 vinyl single (1979) Barry Ferguson Mardi Gras b/w Live In a Dream Record is near mint. Solid Bob Seger-esque rocker all about partyin' at Mardi Gras; b-side is an acoustic guitar driven ballad in waltz time. Produced by Art Riffel (worked with Irma Thomas on Soul Queen of N.O.) Please see the New Orleans section of our store for more great selections.